Update 9/17/16: This story has been updated to reflect additional information from Berkeley Fire Department interim Deputy Fire Chief Donna McCracken. Firefighters were dispatched to the scene of the fire at 3:43 p.m., according to an email from interim Deputy Fire Chief Donna McCracken. The structure is adjacent to 2119 University Ave. and houses a building that stores equipment for the UC Theatre and the now-vacant Krishna Copy Center. Multiple fire engines and paramedics arrived on scene, but there were no injuries reported, according to Berkeley Police Department. BFD has not yet determined the cause of the fire, McCracken said in an email. As of 5:31 p.m., the fire had extended into the building. BFD had extinguished visible exterior and interior flames and had moved to locate and eliminate remnants of the fire in the walls and ceilings of the building, according to McCracken. The nearby apartment building Bachenheimer Apartments was evacuated in response to the fire, McCracken said in the email. A BPD alert at 5 p.m. advised nearby community members to avoid the area and be cognizant of fire hoses in the roadway. Additionally, the alert warned against flying drones over the fire. “It’s not uncommon for vacant buildings to (catch) on fire,” said Steve Finacom, president of the Berkeley Architectural Heritage Association. He added that the building — part of Acheson Commons — is set to be renovated. 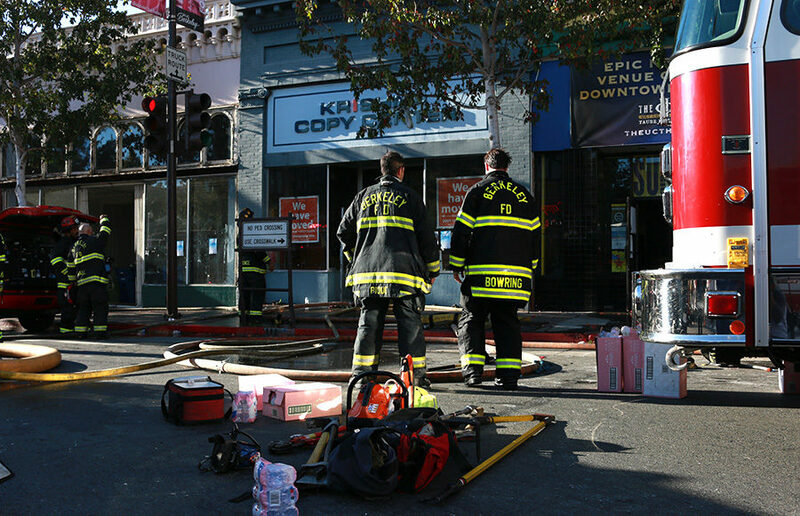 While the vacant space that Krishna Copy Center used to occupy was largely hosed down by the fire department, BFD could not confirm whether the fire had started at the location. Finacom said smoke could be seen rising from the center of the building complex. An Equity Residential spokesperson could not immediately be reached for comment. One UC Theatre employee said he was worried the fire or the subsequent water from combating the fire would endanger the company’s equipment that was stored in the building. As of 5 p.m., multiple fire trucks were still on scene, but paramedic vans had left. Contact Alexandra Yoon-Hendricks and Alexander Barreira at [email protected]. 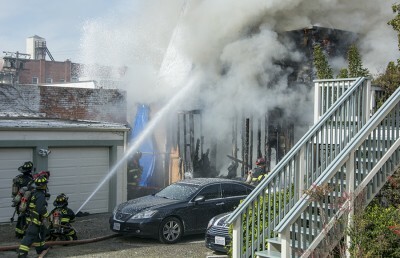 A previous version of the same article may have implied that the building where the fire started houses the UC Theatre. In fact, the UC Theatre stores its equipment in the building. A previous version of this article incorrectly stated that the building where the fire started houses Krishna Copy Center. In fact, Krishna Copy Center is no longer located in the building.